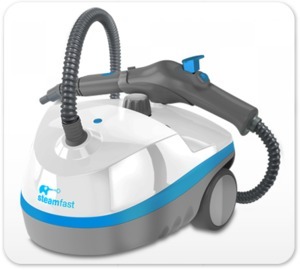 The Steamfast SF-370 Multi-Purpose Steam Cleaner is a heavy-duty solution for those who are serious about steam cleaning. Using ordinary water heated to over 200F, The Multi-Purpose Steam Cleaner effectively and naturally cleans and sanitizes a wide variety of surfaces. With professional steam power and a versatile array of attachments, the Multi-Purpose Steam Cleaner is designed for tackling the toughest jobs throughout your home. The versatile SF-370 even handles floors with the included steam mop attachments and two microfiber pads that are safe for all sealed flooring surfaces - including wood, tile, and laminate. An extra-large capacity tank provides 45 minutes of continuous steam. From shower doors to children's toys, countertops and barbecue grills, theres no job too big - or too small - for the Multi-Purpose Steam Cleaner.